Start your next app project 90% done. Your stories and your audience deserve an amazing, bespoke app. With Richie’s app components for newspapers and magazines, you can build a world class app ten times faster. We make the building blocks of great reading experiences. If you make apps for reading, Richie’s components will make them better: they improve reader engagement and retention, increase reader willingness to pay, and optimize the impact and effectiveness of advertising. That’s because we’ve taken industry best practices in reading experience, advertising, analytics, commerce, and more, and build them into world class, ready-to-integrate native app components. 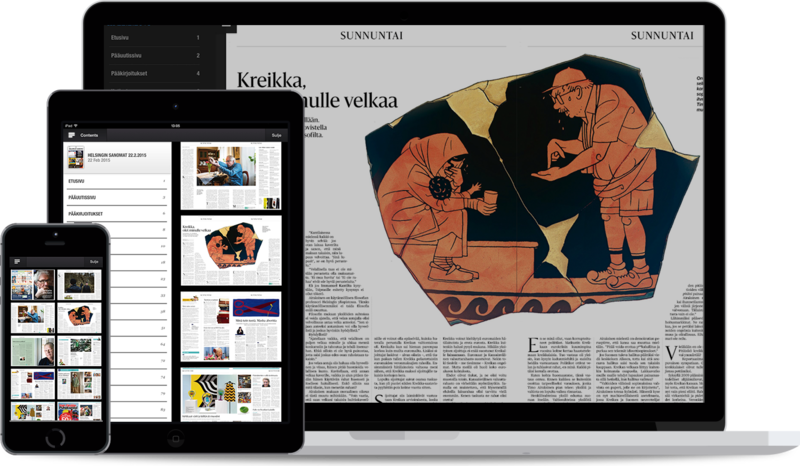 We think great newspaper and magazine apps have a lot in common, yet one size doesn’t fit all. With Richie, you get to pick and choose the best components for your app without worrying about compatibility or integration complexity. And then, with all the basics in place, you build the bespoke, custom functionality and design that sets your app apart. Richie Ads combines the best of print advertising with all the creative possibilities of digital. Richie Ads, our flagship app component, makes rich, full screen advertising a first class citizen in your app. By preloading ads in the background, Richie Ads makes sure that readers will never have to wait for ads to load. This means that ads can be bigger, look better, and ultimately be more effective, as the tiny size limits of regular banner ads are eliminated. Richie Ads comes with native components for iOS, Android, Windows and HTML5 web apps, and is fully integrated with Richie’s other app components. Richie Ads is also an ad server and a full-fledged supply side platform, enabling you to sell your inventory directly, keep 100% of your ad revenue, and maintain full control of your data. When ads actually work, the difference in what you can charge for them is profound. Richie Ads clients often see $100+ eCPMs on their sold inventory. Richie Ads comes with built-in analytics that records actual impressions and on-screen dwell time, even when offline. The full screen Richie Ads creative format is standard HTML5, with IAB’s MRAID extensions. 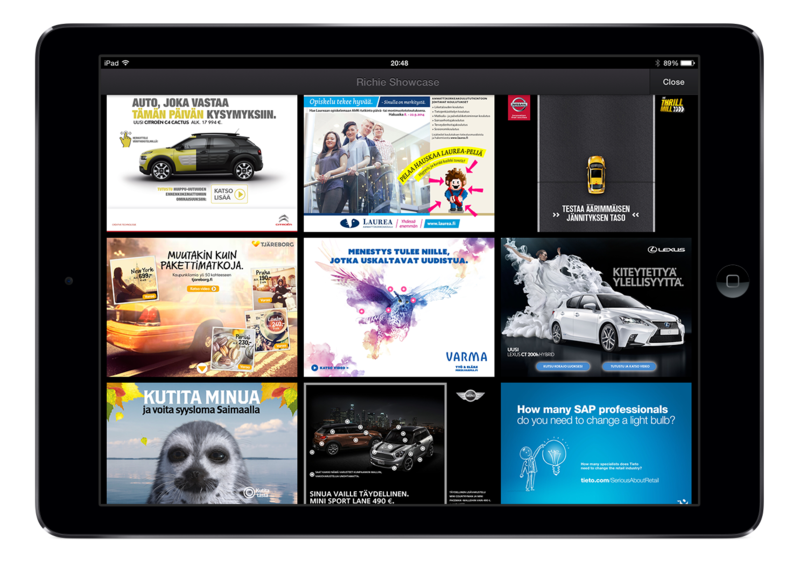 Richie Ads have been created by hundreds of digital agencies worldwide. Maggio: a lean-back reading experience like no other. Richie Maggio is the app component for digital lean-back reading that puts the reader and the content first. We started with the best aspect of print: the simplicity of browsing from left to right, from start to finish. This allows your readers to focus on the content, rather than on the act of navigating it. We then invented a completely new, hardware-accelerated file format for storing high-fidelity pages, quadrupling the resolution (from 3MP with traditional tech to 12MP with Maggio) while halving the download size (to an average of just 500kB per page). Finally, we integrated Richie Ads in a way that guarantees the effectiveness of full screen advertising while eliminating annoying interruptions. With ads as a first class citizen in the content stream, both readers and advertisers are kept happy. Carefully optimized for long form and finite reads. Our proprietary rendering technology, with hardware accelerated compression, delivers twice the fidelity at half the download size. Handcrafted in Maggio Author. Automated with PDFs over SFTP. Or with HTML over an API. No matter how your publication is built, Maggio is the optimal reading experience for it. Richie, including our bespoke development unit Richie Studios, has built apps for leading global newspapers and magazines since 2010. All of Richie’s app components, from the flagship Richie Ads and Richie Maggio, to smaller components for push notifications, analytics, in-app purchases, subscriber entitlements, feed processing, and more, have been designed and built for real apps with real publisher clients. We strongly believe that successful app components can only be extracted from successful apps. Contact us today to see what ours can do for your project.